19th October 1916. Died of wounds received after being shot in the head. Frederick was born on 31st January, 1892 in Eccles, Lancashire the third child of James Hardman and Maria Heaton who were married in 1887 in Eccles. Frederick was baptised in the Wesleyan-Methodist Chapel in Eccles on 15th May 1892. In 1891 James and Maria and their two eldest children were living at 15 Alma Street, Eccles. James was said to be a house joiner. Ten years later in 1901 the family had moved to 15 Mather Avenue, Eccles. James, 37, was a joiner and builder, Marie was 37, Annie 12, Harry 10, Fred 9, Linton 7, Hilda 6, Horace 5 and Gladys 1. James was born in Manchester, but the rest of the family were born in Eccles. By 1911 the family were living at Elleray Cottage, Devonshire Road, Eccles. James 47 was now working for himself as a house joiner, Maria is also 47 and declares that she has been married for 23 years and had 8 children, one of whom had died. Annie H was 22, Harry Clifford 20, apprentice house joiner, Frederic Roland 19, apprentice house joiner, John Linton 17, Clerk (office) Hilda May 16, Tailor’s apprentice, Horace Raymond 15, grocer’s errand boy and Gladys was 11 and still at school. 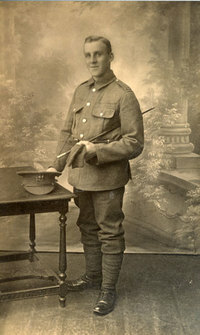 Fred served first in France, then Salonica, where he was shot in the head while serving his Machine Gun. His Officer wrote that no army ever went through more trying times than the first Salonica Army, yet Fred was always cheerful and ever willing. All the letters from his Officers, and pals, speak of Fred’s sterling worth. He was a good soldier, a good son, and a very good workman. A joiner, his age when killed was 23. Frederick is also remembered on the Salford War Memorial. 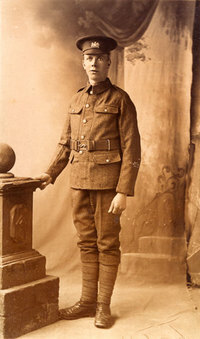 Frederick’s brother Horace Raymond, born 1st December 1895, also joined the Manchester Regiment. He was a Private, Reg No. 9412. He survived the war and in 1928 married Violet Maude Topham. They had two children, Joan and Eric. Horace died in 1985 aged 90.